Australian beef growers can get better returns and their overseas customers a better deal if energy costs can be cut for a firm at the front line of beef exports. The high Australian dollar is a two-edged sword. On one hand Australian exports are more expensive. On the other Australia gets good value for money on high-technology purchases that can be used to reduce costs and increase profits. Finding overseas suppliers for equipment and developing ongoing business relationships has further important benefits for all parties. There is a two-fold benefit when Australia can find good sources for equipment from its trading partners. This supports the momentum in their economies. It maintains Australia's customers purchasing power for buying its exports. It helps to counteract the slowing of economic activity in Australia's major trading partners such as China and in Europe that reduces the demand for Australian exports. A business that is a staging area for beef exports has extensive cool-rooms and freezers with very high energy requirements. The carbon price is a significant impost as is the rapidly rising cost of electricity distribution in Australia. The challenge and opportunity is to find cost-savings with commercially viable energy supply and automated management technology. Systematic international food safety management in the industry in accordance with "Hazard analysis and critical control points" (HACCP) may be simplified if automated energy management technology can tackle part of the compliance costs for record-keeping. Automating alerts and responses when any cool room temperature deviates from what is required could avert product spoiling. Retail energy costs in Australia are especially high by international standards as a result of massive investment in the distribution grid. The carbon price that commenced on July 1, 2012 has added to this cost. These costs make the goal of commercially viable local generation an easier one to achieve. Generating energy locally tends to be cheaper per kilowatt with larger systems. This means that larger systems such as the recently installed trigeneration plant at Coca-Cola Place in North Sydney are proving to be commercially viable. A generation system for a single residential household is more difficult to cost-justify. Establishing commercial viability of generation systems suited to medium sized businesses with multiple sites is getting easier. Continually growing retail energy prices and advances in technology both make this problem easier to solve. In broad terms a local energy generation system can be used to produce electricity to supply about half of the energy needed for cool rooms and freezers. The "waste heat" from the generation system can be used in absorption chillers to supply the other half of energy needed for cool rooms and freezers. Fuel is used far more efficiently than in large central power stations. The carbon price is not payable by any enterprise emitting less than 25,000 tonnes of carbon dioxide per year. The amount of carbon dioxide emitted is much less than that from a coal-fired power station even if any carbon price becomes payable. About 75 percent less. The major cost component - the infrastructure to transmit power from large central power stations - is not avoided. It is not only the owner of the local generation system who saves money; Electricity grid investment is avoided and this bestows a benefit on every energy consumer. Potential suppliers may be easier to find in Europe where local generation is more widespread than in Australia. 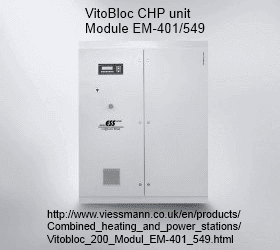 One example is the German manufacture Viessmann Group that builds Vitobloc combined heat and power units. These power generation systems are manufactured in a range of outputs so matching the technology to different businesses' energy requirements is not too difficult. A small number of businesses have designed and created a huge range of wireless sensors, controllers and information systems that build upon internet and smart phone technology. These new devices have enormous potential in many areas of home life, agriculture and industry. Safety, health and comfort of the elderly and people with disabilities living in their own homes is just one of many areas where this technology should be applied sooner rather than later. Another area is in monitoring and controlling the operation of business equipment such as energy generators, freezers and cool rooms. All operations can be continuously monitored and controlled according to an automated schedule. Alerts where any unusual situation arises can be immediately notified via the internet to any smart phone. People can send instructions over the internet with smart phone apps to remotely control business machines and without needing to travel to the business premises. One of these businesses is Nanjing IOT Sensor Technology that has developed a great many different devices and software. The slow-down in major world economies is making business conditions difficult for such innovators. An Australian business could benefit by establishing an ongoing working relationship with such a supplier, providing feedback and design ideas to tailor products to best suit its needs while at the same time helping create wider awareness of the benefits this innovative technology provides.